Morgan Spurlock's new documentary, Pom Wonderful Presents: The Greatest Movie Ever Sold, is a sly look at product placement in films. With a simple premise. Make a movie using just money gained via product placement. Morgan comes across as an "everyday Joe", the total opposite of Michael Moore but this is an advantage to show off how much this practice happens in Hollywood. To paraphase a film, "If you can brand it, the money will come..."
No UK trailer exists at the moment so here is the US one instead to keep you interested. Boundary-pushing Oscar®-nominated filmmaker Morgan Spurlock explores the world of product placement, marketing and advertising in Pom Wonderful Presents: The Greatest Movie Ever Sold, a film that was fully financed through product placement from various brands, all of which are integrated transparently into the film. While using brands in film promotion is not new for Hollywood, it is certainly new territory for the documentary format. Spurlock exploits the phenomenon to new heights, with everything from branded pizza boxes and in-flight film promotions to branded-everything in-film. 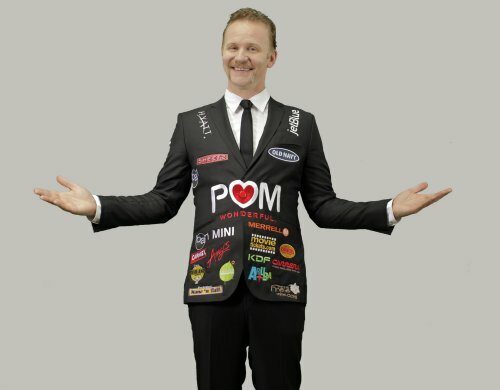 A very powerful but also irreverent brand in his own right, filmmaker Morgan Spurlock is much loved in the UK. With humor and insight in Pom Wonderful Presents: The Greatest Movie Ever Sold he unmasks the marketing process to bring audiences behind closed doors directly into the pitch meetings and marketing presentations which ultimately inform our everyday entertainment decisions. Pom Wonderful Presents: The Greatest Movie Ever Sold is as much a celebration as it is a critique of this now commonplace form of co-promotion.